An IR study looks at combining lung cancer biopsy and radiofrequency ablation into one procedure. Any lung nodule is presumed to be malignant unless proven otherwise, says Abbas Chamsuddin, MD, an interventional radiologist in Decatur, Georgia. So when patients whose scans show a single lung nodule are referred to him, he will treat the nodule with radiofrequency ablation (RFA) regardless. Chamsuddin believes it is better to treat right away with RFA than to do a lung biopsy and wait a week or two for the pathology report before proceeding. A delay of a week or two likely would not affect the outcome, “but it can be disturbing for the patient who knows they may have a cancer that isn’t being treated,” he says. To support this point, Chamsuddin conducted a study of 19 patients each initially diagnosed with a single lung nodule and who were referred to his practice for CT-guided lung biopsy. The patients underwent RFA and biopsy at the same time, all under general anesthesia. Of the 19 cases, only one was negative for malignancy—the patient had only atypical cells. Of the 18 positive biopsies, three cases (16%) were primary squamous cell and 15 cases (84%) were nonsmall cell cancer. In two patients, two nodules were biopsied and ablated, both in the right upper and lower lobes. The lower lobe nodules were negative for cancer but both upper lobe nodules were positive. Chamsuddin reported his findings at the Society of Interventional Radiology (SIR) annual meeting in Atlanta and in the Journal of Vascular and Interventional Radiology in February 2015. While his sample size was small, Chamsuddin believes “the results were really amazing.” He is convinced that if the study had a larger number of patients, he would get the same or similar results. Conducting the treatment and the biopsy at the same time has several advantages, including helping to minimize the patient’s anxiety, reduce costs, and improve safety, Chamsuddin says. Most importantly, he adds, simultaneous treatment offers the patient a potential cure at the same time as the biopsy. “If the biopsy comes back that the nodule is malignant, we can say to the patient, ‘The bad news is you have cancer. The good news is it is gone.’” In a majority of cases, where the patients with nodules that had been ablated were referred to oncologists for follow-up, the oncologists told them they did not need chemotherapy or radiation because their tumor was gone, Chamsuddin says. Patients with suspicious lung nodules who were not treated at the same time as the biopsy ended up having both surgery and follow-up treatment, Chamsuddin notes. Conducting both procedures at the same time is cost-effective because it requires only one procedure room set-up and the patient undergoes anesthesia only once. The double procedure takes slightly longer than each would take to do individually but not substantially so, Chamsuddin says. Combining procedures also assures that the nodule treated and the area biopsied are the same. For his study, Chamsuddin inserted a large needle into the lesion and placed ablation probes in the nodular parenchyma and deployed their prongs. This was followed by placement of a trochar needle and biopsies performed using a coaxial biopsy gun. Ablations were then performed at 150 W and 105°C until the desired temperature was reached and then extended for three to five minutes beyond that point. “With the radiofrequency probe in place, we know exactly where it is to biopsy it,” Chamsuddin says. With any procedure that requires placing a needle in the lung, patients are at risk of pneumothorax, air or gas seeping in the fluid-filled pleural cavity between the pleural membranes of the lung and the inner chest wall. Patients have about a 10% to 30% chance of pneumothorax occurring each time their lung is punctured. To treat pneumothorax, the interventional radiologist places a small size thoracotomy catheter in the patient’s chest. Combining the RFA treatment and the biopsy lowers the overall risk for pneumothorax because the patient undergoes one procedure instead of two. SIR President-elect Charles E. Ray, Jr, MD, PhD, FSIR, a professor and chair of radiology at the University of Illinois College of Medicine at Chicago, believes this is a very significant advantage because if a patient develops pneumothorax it can delay treatment. “And you don’t want to delay treatment once you have a diagnosis of cancer,” he says. Seven patients in the study developed intraoperative pneumothoraces, which were immediately treated by placement of small size thoracotomy catheters. Of them, six were resolved within 48 hours and the patients were discharged home. One patient’s hospital stay was extended to six days due to air leak. After discharge, the patient was readmitted within 48 hours for recurrent pneumothorax. In another patient, pneumothorax recurred after discharge and he was readmitted for four days due to air leak. Overall the percentage of patients who developed pneumothorax in Chamsuddin’s study was within the typical range. Earlier this year, the Centers for Medicare & Medicaid Services agreed to cover lung cancer screening with CT for mostly current and former heavy smokers. Physicians are hoping to catch more lung cancers earlier, when they are more treatable. Chamsuddin expects that as CT lung cancer screening expands, more patients will be referred to interventional radiologists for biopsy and treatment of nodules. Doing the biopsy and treatment in the same procedure is a change and “would be a learning curve for referring physicians,” Chamsuddin says. And the combined procedure is not for every patient with suspicious lung nodules. It is limited to patients whose lung cancers are in their early stage, according to Chamsuddin. Brown believes the combined procedure would be a particularly useful option in cancer patients who are not surgery candidates. For example, Ray says smokers whose lungs are compromised are often not candidates for surgery. “Many [smokers] have emphysema as well as lung cancer and going in and taking out a lobe may not be advisable,” Ray says. Brown also thinks it is important if all the specialties involved in treating a patient with a lung nodules agree the combined procedure is in the best interest of the patient. “These patients should be evaluated in a multidisciplinary setting with all collaborating specialties agreeing that this is the best approach for a particular patient,” he says. Ray sees the Chamsuddin study as a technical accomplishment more than anything else. “This is really a feasibility study,” he says. “It asks the question, ‘Can it be done?’ And the answer is, yes, it can.” Treating small lung nodules with ablation is not new, he says. “It’s the technology of doing both at once that’s the advancement.” This is an example of IR harnessing image-guided therapy to change medical practice and improve the standard of care, Ray says. In the past, Ray says, an interventional radiologist may have used ablation and never got a piece of the tissue to send to the pathology lab. “A biopsy allows the interventional radiologist, medical oncologist, and the pathologist to determine what type of tumor it is and what is the best drug to treat it,” Ray says. Ray also sees potential for another interventional procedure for treating lung nodules—chemoembolization. Chemoembolization, where cancer drugs are injected directly into the blood vessels that feed a cancerous tumor, is used successfully to treat liver cancers. It was tried for lungs back in the 1970s, Ray says. 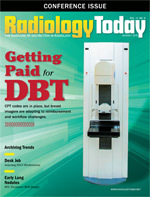 Forty years ago, the tools for imaging and for delivering the chemotherapy were not as high quality as they are now. Back in the ’70s, interventional radiologists stopped using chemoembolization for lung cancer because a number of patients ended up with very serious complications. The problem was that blood vessels that supply the lung tumors also can go to the spine and spinal cord and the interventional radiologists had no way of stopping the chemotherapy from destroying the spinal cord as well as the tumor. But now that the tools have advanced to the point “where we can now recognize the blood vessels going to the spinal cord and avoid them, the procedure has become much safer,” Ray says. Ray anticipates that in five years, chemoembolization may be an alternative to ablation for many patients with small lung nodules as well.